WordPress remains one of the best CMS for beginners. So if you are new to this business, WordPress will be a perfect fit. Besides that, you can save a great deal of money, because a ready made theme costs less than custom design. Another great thing of this kind of templates is a built in Cherry Framework that makes installation and customization process quick and easy. Here you will find a collection of Top 20 best WordPress themes for small business project. All the themes are designed by professional developers and meet all modern IT standards. They also feature a variety of visual effects including, sliders, parallax, galleries, etc. A professional touch gives you full control over the site and allows to make any changes in seconds. Thus you will be able to change any element of your website without any coding skills at all. Thanks to a fully responsive design, it will automatically adapt to any possible screen resolution and will perform well on both desktops and smartphones. So, go ahead and choose the best WordPress themes for small business project, and customize it according to your preferences. You will see how easily you can design a fully functional site in a week. 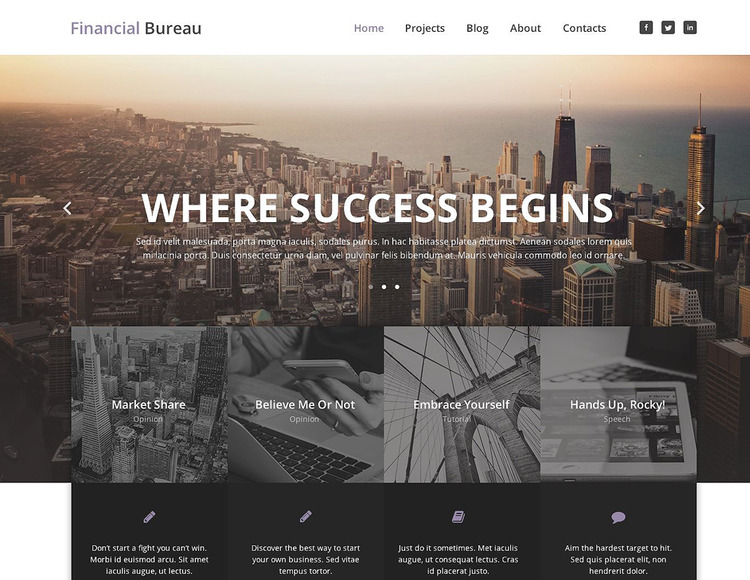 Financial Bureau is best WordPress Theme for small business project. It comes with many features and responsive design. You can build a beautiful business site with the theme features. With this theme you don’t have need to install any plugin for the slider or contact form. 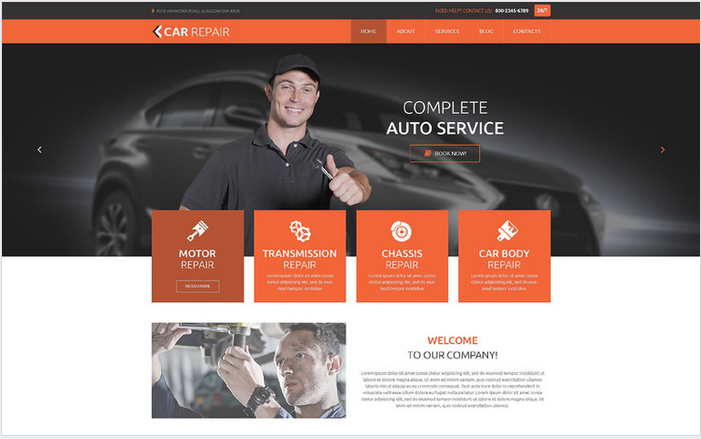 Theme Features: Responsive Design, Parallax Scrolling, Beautiful Slider, SEO Ready, Bootstrap Design, Widget-Ready, WPM-Ready, Short-Codes, Contact Us Form, Testimonial Section, Google Maps, News-Letter Form, Portfolios page. 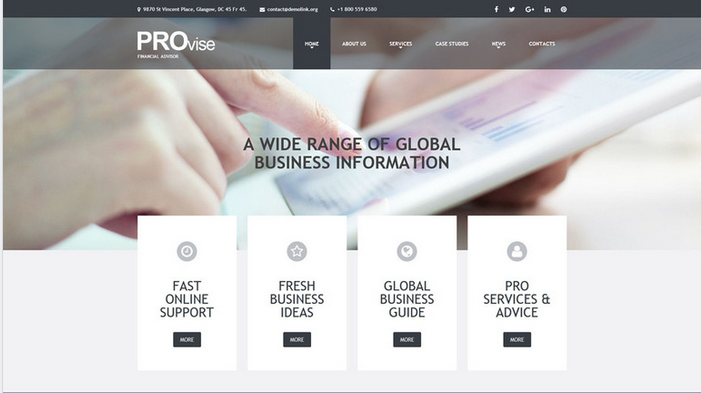 Provise is beautiful, elegant design Business and Finance WordPress Theme. With this theme you can create an outstanding business website. This theme has lot of features. I’ve shared Top 20 Best WordPress Themes for Small Business projects with you, please check out them and let me know which one do you liked the most? I want to recommend you one more business WordPress theme named Veriyas Pro. It has great features like customizing your homepage own way, change color schemes, inbuilt shortcodes, portfolio sections, etc. It will help you.